Polling shows independents are unlikely to follow endorsements by President Donald Trump or his 2016 Democratic rival Hillary Clinton. Pope Francis’ endorsement is more popular but less influential than those of American evangelicals Jerry Falwell Jr. and Joel Osteen. The potency of political endorsements has largely waned in an era of extreme polarization, but they can still be effective when deployed carefully and work most often with partisans. That’s a key takeaway from a new Morning Consult survey — conducted Feb. 28 through March 2 among a sample of 1,995 registered voters — testing the influence of endorsements from a number of political players, special interest groups, faith and business leaders, pundits and celebrities. 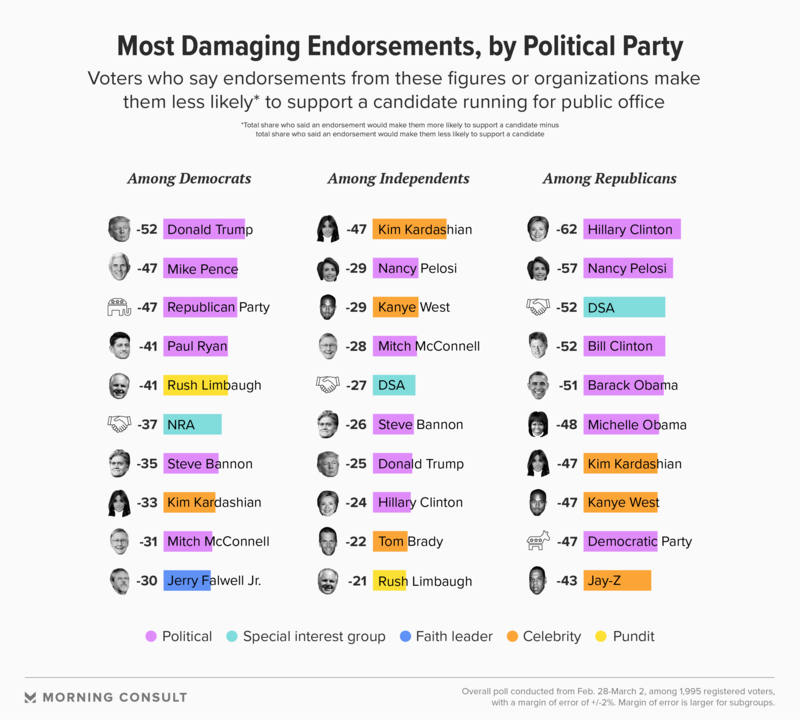 In terms of clout, the list is dominated by well-known figures from the two major political parties and the special interest groups aligned with them. The tally of influence was ordered from smallest to largest by the share of registered voters who said that person’s or entity’s endorsement “made no difference either way” when it came to affecting their potential vote for a candidate for public office. The Republicans and Democrats surveyed did not share many opinions on endorsements, but they were most likely to agree that their spouse’s or significant other’s opinion about a candidate could be influential. Half of Democrats and 51 percent of Republicans said a spousal endorsement would make them more likely to vote for that candidate. A plurality of independents (37 percent) agreed. Men, in general, were also more likely than women to say the opinion of their spouse or significant other mattered (49 percent compared to 42 percent). Former President Barack Obama and ex-first lady Michelle Obama held the most bipartisan appeal as they finished near the top of the list for independents, who tended to view most political figures negatively. Their potential endorsements only netted a plurality — of 13 and 12 net percentage points, respectively (the survey carries a 2-point margin of error) — of voters who said they’d be more likely to vote for a candidate with their public backing. By comparison, President Donald Trump and 2016 Democratic presidential candidate Hillary Clinton ranked near the bottom among independents, damaging their top-line influence. Trump is the top dog in his party — but two special elections within the past year have shown the limits of his influence on Republican voters. In the 2017 Alabama Senate race, incumbent GOP Sen. Luther Strange secured an August endorsement from Trump, when Morning Consult polling showed 56 percent of Alabamians approved of the president’s job performance (net approval of 18 percentage points). But Strange was unable to defeat conservative outsider Roy Moore in the following month’s Republican primary runoff. There was also Tuesday’s contest to replace former Rep. Tim Murphy (R-Pa.), where Republican candidate Rick Saccone underperformed Trump in Pennsylvania’s 18th Congressional District by roughly 20 points despite two visits and an endorsement from the president. And even if a primary endorsement from Trump might help swing a race for a specific candidate, the president’s negative net approval rating could also cause the GOP problems during the general-election phase of the midterms, juicing opposition turnout and losing swing voters. The survey shows that by a 47 percent to 22 percent margin, Trump’s support for a candidate was more likely to turn off independents, as well as 69 percent of Democrats. The White House did not respond to a request for comment. That’s not to say endorsements can’t be a big help. A seal of approval from a popular political figure with a potent email list can go a long way in filling the coffers required for a successful campaign at the federal level. Sen. Bernie Sanders (I-Vt.) may not officially be a Democrat, but he’s using those attributes to wield influence in Democratic House primaries of his choosing. Republicans have observed a similar effect on the right in the form of endorsements from Fox News commentator and radio host Sean Hannity, who ranked just behind House Speaker Paul Ryan (Wis.) for endorsement clout among Republicans. “Hannity, Mark Levin — if they endorse a candidate and the candidate gets on the show, it brings a lot of money to a campaign,” said Rick Tyler, partner at Foundry Strategies, GOP consultant and former spokesman to Ted Cruz’s 2016 presidential campaign, in a March 7 phone interview. Get the latest news, data and insights on politics, policy and government. Pope Francis Most Liked, Least Influential Among Faith Leaders: The pope has ruffled a few feathers with some perceived liberal positions, and his endorsement is more popular with the general public than those of U.S. evangelical Christian leaders Jerry Falwell Jr. and Joel Osteen. However, he’s slightly less influential than that duo: Thirty-nine percent of registered voters said Francis’ backing for a candidate would make no difference either way, compared with 33 percent for Osteen and 31 percent for Falwell. Buffett’s Endorsement Best Among Business Leaders: Berkshire Hathaway Inc. Chairman and CEO Warren Buffett shares top billing on clout with the left’s political boogeymen, Charles and David Koch, and the right’s, George Soros. But while support from the latter three is likely to downgrade a candidate’s chances of getting a vote, an endorsement from Buffett improves those chances by a 12-point margin. 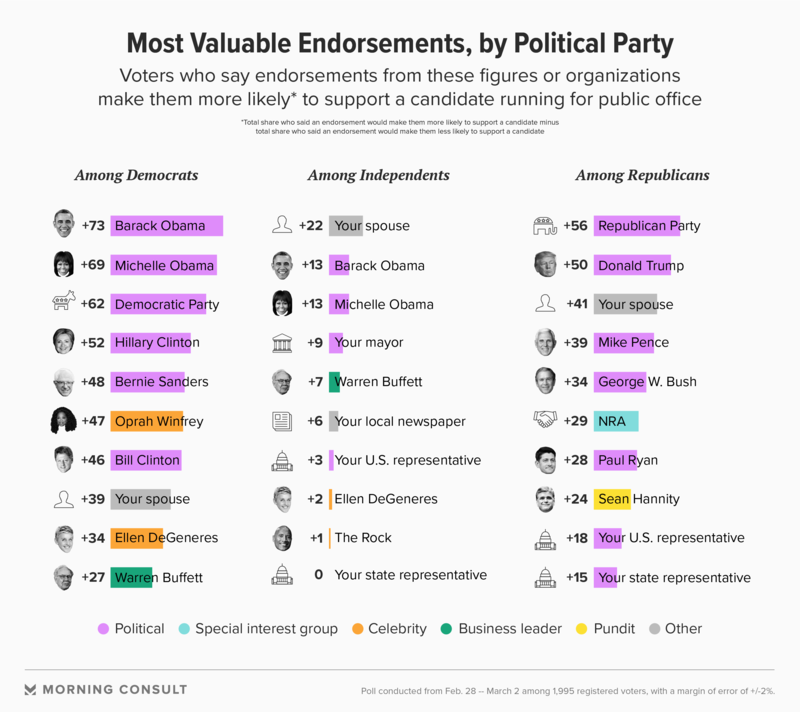 Oprah’s Endorsement Tops Celebs’ List: Of the celebrity options, Oprah Winfrey was both most influential and most likely to help a candidate, by a 4-point margin. Dwayne “The Rock” Johnson and Ellen DeGeneres also netted some influence (by 3 points and 1 point, respectively), while Hollywood couple Kanye West (-35 points) and Kim Kardashian (-42 points) were the most likely to turn voters off.